Yesterday, the people of Wales celebrated St. David’s Day. Back in the sixth century, Dewi Sant helped establish a monastery on the site where St David’s cathedral, Pembrokeshire, now stands. “Dydd Gwyl Dewi” celebrates the life and death of this popular saint, and the first of March has been a national day of remembrance for the Welsh patron saint since the eighteenth century. My favourite St David’s Day tradition has to be Welsh Cake making. Known as “picau ar y maen”, these Welsh wonders are baked on a bakestone, and traditionally contain sultanas, currants and raisins. They are often compared to scones, but are much denser and doughier than the traditional scone, and are not usually eaten with any accompaniments. As a child, and not yet having developed a particular taste for dried fruit, my mum used to make the South Wales variation known as a Jam Split, which was created using two thinner disks of cake sandwiched together with raspberry jam. Whilst I now also like the more traditional variety, I still make the jam versions as a nostalgic alternative. This year, I wanted to try some new flavours. The first flavour I opted to make was a white chocolate and lemon version, with a hint of cardamon, and the second being a twist on the Jam Split variety with the addition of a peanut butter layer to the jam one, playing homage to one of my favourite American exports, the PB&J sandwich! 1. Sift together the flour and baking powder. Add the cold butter and rub together to make breadcrumbs. 2. Add sugar, baking powder and spices and stir well to combine. Add in the dried fruit and combine. VARIATION: To make a Jam Split, do not add any dried fruit. To make a white chocolate and lemon version, grate in the white chocolate and the rind of a large lemon, and add the cardamon seeds. 3. Make a well in the middle of the mixture and pour in the whisked egg into the well and combine using a knife using figure of eight movement to do so. Add milk as necessary until you can bring the mixture together to make a ball ready for rolling. Add the milk a little at a time to avoid making the mixture too wet. VARIATION: For the white chocolate and lemon version, add in a tablespoon of lemon juice at the binding stage. 4. VARIATION: For traditional or white chocolate and lemon versions, roll the dough on a floured surface so that you have a sheet which is approximately half an inch thick. VARIATION: For Jam Splits roll the dough to a quarter of an inch. 5. Cut into rounds or any shape you like. I like to use stars and hearts. VARIATION: for the Jam Splits, sandwich together two pieces with your choice of jam. For the PB&J version, add a layer of peanut butter. 6. Heat your bake stone or nonstick frying pan and grease with a little butter. 7. Cook them on a medium to high setting, and each side will need a couple of minutes to cook. You will have to keep an eye on them to avoid them burning. 8. Remove from the pan and let cool slightly on a rack. 9. VARIATION: sprinkle the raisin ones with sugar, and all other flavours with edible glitter (optional). 10. Eat warm or cold. 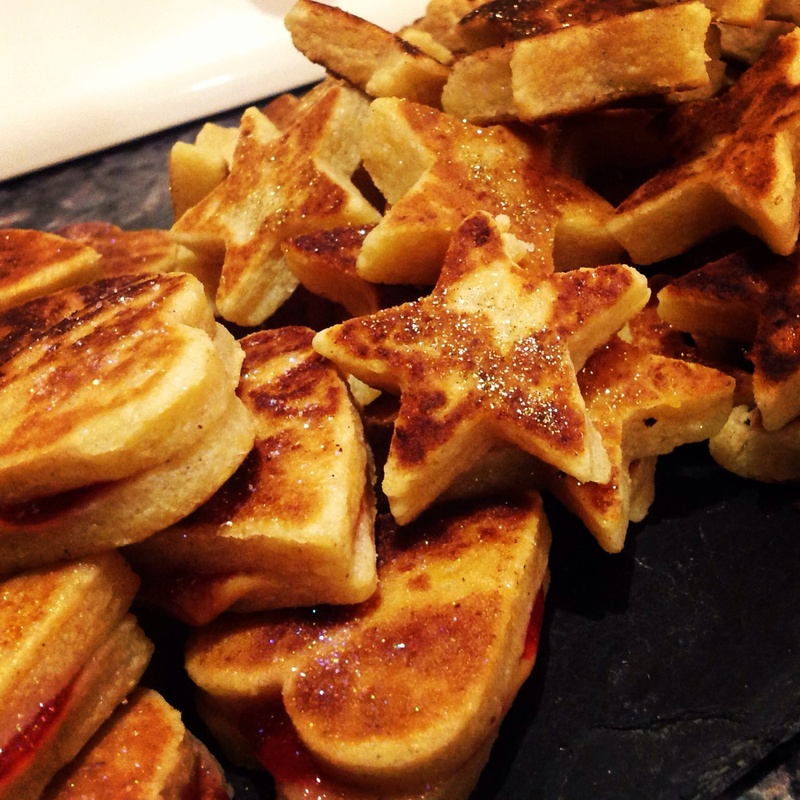 This entry was posted in Feasts!, Happy Holidays and tagged Baking, jam splits, patron saint, PB&J, Peanut butter and jelly, scones, st David's day, Wales, welsh cakes, white chocolate and lemon. Bookmark the permalink. Thanks Rebecca – it’s always more fun using shapes!! Please share any other interesting flavours you have tried!